Almost three years after its appearance, the “release” front bumper can be said to have brought benefits as a means of encouraging drivers to drive well on tracks. But it still has some … downsides. “In 2015, the entire karting community of karting welcomed the CIK-FIA’s introduction of new front bumper panel attachment systems, in order to reduce inappropriate behaviour out on the track”. So read a statement from the Federation in July 2016. Basically, the result is clear: since there has been a collapsible front bumper, there have been no more accidents at the first bend of the finals as we saw years ago, that often put the best performing drivers out of action after covering just a few metres of the track. It must be said, however, with no intent of being polemical, that – considering the numerous penalties that rained down on the drivers in the first races of the 2017 season, and which caused significant malcontent in the paddocks – this front bumper still raises doubts and certainly need some technical refinement or, perhaps more probably sporting changes to conclude a development that is still far from perfect. Let’s take a look at the fundamental stages of the collapsible front bumper in 10 points. The debut of the first collapsible front bumper took place on the weekend of 13 July 2014. The Academy drivers tested the system at the European Championship in Wackersdorf: the test was perhaps a little rushed and took drivers (and karts) by surprise, causing some controversy. Nevertheless, the system was substantially approved and accepted. The new spoiler made its official debut at the WSK Champions Cup, held at the beginning of the 2015 season on the circuit at Muro Leccese. The system worked, but not faultlessly: it would sometimes release without any contact. The rule provides for a 30 second penalty each time the spoiler is released, but the race officials procrastinate and prefer to analyse each individual case. The spoiler is also used in the WSK Gold Cup and in the first round of the Masters Series. However, the controversy increases and becomes rather energetic, especially due to the lack of safety. Among the dissenting voices, Dino Chiesa’s came to the fore and he penned a very precise and relatively critical letter. The CIK-FIA realised that the system needed further work. Indeed, when running into an obstacle with the front bumper released by the system, in certain extreme cases the probability of the kart overturning increased, thereby compromising safety instead of improving it. In a statement dated 17 March 2015 the CIK-FIA officially communicated a temporary “stop” on using the collapsible front bumper. The Federation and KG, the manufacturer responsible for producing all the attachments for the collapsible front bumpers, went back to work. The idea was right, but safety needed to be guaranteed. At the end of March 2015, at Castelletto di Branduzzo, the modifications were tested out on the track and TKART was there to see the tests: the bumper was released as before, but did not fall to the ground. It remained more firmly anchored to the supports and no longer dragged along the ground. 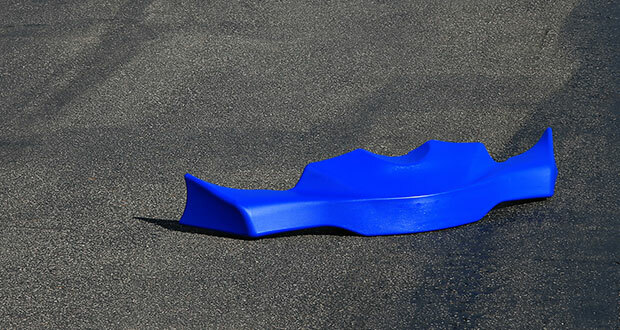 On 24 April 2015, the CIK-FIA officially declared the return of the collapsible front bumpers: the tests provided safety guarantees and, from May onwards, the system was once again mandatory for races in all classes. The new debut took place in the KF and KF-Junior European Championship round at Portimao. For the statistics, 22 30-second penalties (6 in the KF class and 16 in the KFJ class) were imposed on that occasion due to incorrect positioning of the front spoiler. At the meeting in Paris on 28 August e CIK-FIA modified Article 31 of the “CIK-FIA Specific Prescriptions”, reducing the penalty for incorrect positioning of the front bumper from 30 seconds to 10. The new collapsible front bumpers were regularly used in all 2016 races, but the controversy soldiered on. In particular, the paddock complained about operating disparities between the different models. In practice, however, everything was above board since all the systems used in the races were subjected to approval which also involved crash testing. The moment any device gains approval, it is automatically fit for use. In late July, a statement from the Federation officially announced new technical modifications affecting both the spoilers and, above all, the support brackets. The modifications took effect from 1 November 2016. So, yet another “debut” took place at the OK and OKJ World Championship in Bahrain. The penalties imposed by the race officials during the event numbered 100 (29 in the OK class, including 9 in the final alone, and 71 in the OKJ class). The first races of 2017 have not appeared to quell the controversy. The number of the penalties is very high and much of the time the bumper ends up being the decisive factor in the order of arrival. Of course, the number of contacts has decreased, a sign that, from this point of view, the introduction of the collapsible bumper with release mechanism works. However, perhaps something still needs to be done to finally make this a truly definitive solution. In the Champions Cup the penalties numbered 159 (77 in the 60 Mini class, 42 in the OKJ class, 21 in the OK class and 19 in the KZ2 class). In the first round of the WSK Super Master Series there were 171 penalties (45 in the 60 Mini class, 46 in the OKJ class, 27 in the OK class and 53 in the KZ2 class). In the second round of the WSK Super Master Series there were 162 (50 in the 60 Mini class, 40 in the OKJ class, 39 in the OK class and 33 in the KZ2 class). The results were better in the third round of the WSK Super Master Series in La Conca, where only 68 penalties were handed out (27 in 60 Mini, 23 in OKJ, 11 in OK, 7 in KZ2), a sign of how even the weather factor has a significant effect with the rain that exponentially increases the risk of the front bumper “coming off”. In the last round, penalties have risen to 116, with 30 in 60 Mini, 28 in OKJ, 34 in OK, 24 in KZ2. The first two rounds in the European Championship continued the trend, even if the smaller number of categories and drivers on the track inevitably lowered the number of penalties. There were 84 penalties in the first round in Sarno (31 in OKJ, 39 in OK, 14 in KZ). This dropped to 53 in the second round in Genk (6 in KZ, 24 in KZ2 and 23 in the Academy where, however, there were 10 penalties in the final). A. There is still a possibility that front bumpers unhook themselves without unsportsmanlike contacts, penalizing drivers who do not deserve it. What happened to Riccardo Longhi (Birel Art / TM Racing) in Rd1 of the European Championship in Genk, in Belgium, is an example. The Italian driver, on his debut in an international CIK-FIA race, came third. It’s a shame that its bumper is not properly and completely in its housing. Riccardo does not know when the nose could have partially moved from its correct position. The technicians discuss the problem, trying to remember an exaggerated manoeuver by the Italian, but they can’t think of anything he might have done. Also, there are no signs of contact on the bumper (on the contrary, the rear bumper of his Birel Art kart is visibly bruised, a sign that the blows came from Longhi, rather than from somewhere else). What could have been a great moment in our sport changed into the weeping of a driver penalized with 10 seconds, finishes in 12th place rather than third, and he still does not know why. B. There is a possibility, which is not uncommon, that a driver may purposely brake to generate a contact with those behind him and for the front bumpers of the latter to fall off. Question: what would have happened if a bad competitor had braked in front of Paolo De Conto last year in Kristianstad when he won the World Championship, making his front bumper drop? If it is not possible to appeal against the 10 second penalty, then De Conto should have been punished! Would all this have been right? C. There should be discretion by the sport commissioners on the reasons that led to the bumper coming off. The collapsible front bumper should become a simple “sign” of a possible offence. If other elements are added to this, such as the report of a route commissioner, a complaint from another pilot, or a report by a race official, then it can be considered an element that could lead to penalties for a truly bad driver. D. The risk is that karting could become a competition that is “front bumper dependent”. Therefore, perhaps a modification – to the sporting regulations, if not to the technical aspect – can still be made in order to make the system effective definitively.